DNA from any of the Bin Laden children in the compound could be compared with a sample from his sister, who died in Boston in 2010, to provide evidence that the family was present. So agents approached [Shakil] Afridi, the health official in charge of Khyber, part of the tribal area that runs along the Afghan border. The doctor went to Abbottabad in March, saying he had procured funds to give free vaccinations for hepatitis B. ….In March health workers administered the vaccine in a poor neighbourhood on the edge of Abbottabad called Nawa Sher. The hepatitis B vaccine is usually given in three doses, the second a month after the first. But in April, instead of administering the second dose in Nawa Sher, the doctor returned to Abbottabad and moved the nurses on to Bilal Town, the suburb where Bin Laden lived. ….A nurse known as Bakhto, whose full name is Mukhtar Bibi, managed to gain entry to the Bin Laden compound to administer the vaccines. According to several sources, the doctor, who waited outside, told her to take in a handbag that was fitted with an electronic device. It is not clear what the device was, or whether she left it behind. It is also not known whether the CIA managed to obtain any Bin Laden DNA, although one source suggested the operation did not succeed. The ISI has since arrested Afridi for cooperating with foreign intelligence agents. “Wouldn’t any country detain people for working for a foreign spy service?” a senior official told the Guardian. I suppose so. On the bright side, it’s good to see the CIA thinking creatively again. 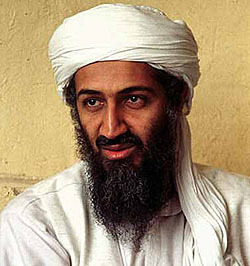 Too bad Osama didn’t smoke cigars.